Everyone has their favorite set up when it comes to flipping and pitching. Mine is a PowerTeam Lures 3.5″ Texas Rig Jig. I have one tied on most of the time; however sometimes different situations call for different approaches. 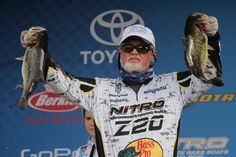 There’s so many different craws, worms, jigs and creature baits on the market today, it can be overwhelming when it comes to choosing the right bait. After hundreds of dollars of experimentation, I’ve been able to narrow it down, and have the confidence to throw a series of baits under various circumstances. The three most common flipping situations that I’ve found fishing in southern Ontario are lily pad mats, cane and bulrushes, and docks. When it comes to each situation, I have a few different rigs depending on water clarity, depth and the density of the weeds. I’ll start by talking about lily pads as they’re found on almost every lake in southern Ontario. 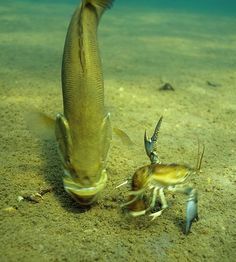 If the water underneath the pads is deep enough for a Bass to survive, there will probably be some under there. When choosing a bait to flip pads, I look for one with a narrow profile and smaller legs and appendages. Two of my favorites are a Strike King Rodent and Reaction Innovations Sweet Beaver. 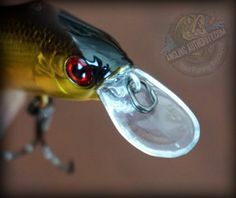 The narrow profile and small legs allows the bait to slide between the pads, while larger craw type baits have a tendency to get caught up on top and not fall through. When choosing a weight, 3/8 ounce tungsten is pretty standard and will work in most situations. I wouldn’t go any lighter than that in pads, but in thick, large mats, it can help to bump it up to a half ounce tungsten weight. I tend to use a lot of the same techniques when flipping shower water cane, bulrushes and docks. I haven’t found anything more productive than a craw or a jig. You’re not worried about punching through mats, so it’s all about matching the hatch. Starting with craw selection, the biggest factor is water temperature. In cool water or cold front situations, less action is better. 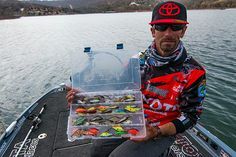 PowerTeam’s Texas Rig Jig or Craw D’oeuvre is perfect for that. The craws have a very subtle, tempting action that triggers bass no matter what the conditions. In the heat of the summer, you can’t beat a Strike King Rage Craw. The claws on this bait have an amazing action, even with the smallest of movements. The same theory applies with jig/trailer combinations as well. Cold water conditions, a trailer with minimal action such as a Strike King KVD chunk is perfect, but when the water warms up, a Rage Tail Chunk or a Berkley Chigger Chunk. When flipping Texas-rigged plastics, I prefer to allow the weight to slide up and down the line as opposed to fastening it to the bait. 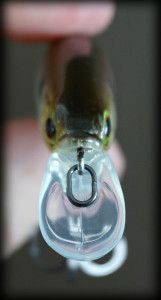 When it hits the water, the weight will slide up the line and hit the bottom almost instantly. 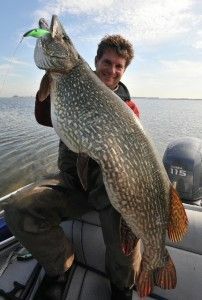 This lets the bait slowly flutter to the bottom on slack line. The deeper the water, the longer the bait has to fall. I have found this draws a lot more bites compared to thumping the bait off the bottom. The water clarity dictates what colour I’ll start with, and it’s pretty much the same for each technique. In clear water, the classic natural colours such as green pumpkin or watermelon are my favourite. The Okeechobee Craw colour has also gotten quite popular in recent years, as it resembles a rusty crayfish quite well. If the water is slightly stained, but still has decent visibility, I’ll always start with watermelon red flake. The red flakes really make a lure glow in stained water, and trigger a lot of strikes. In dirty water, you really can’t beat straight black or black and blue flake. Generally when I’m using a pure black bait, or anything with red flake, I like to pair it up with a red EWG Offset Worm Hook. For every other colour, I use a black hook. The new Shimano Compre 7’2” MH Worm and Jig Rods that came out over the last year will suit pretty much any flipping situation you will come across. These rods pair up perfectly with the Curado 200G7 series reels. For flipping, a high speed reel is critical. It not only allows you to pick up and cast much quicker than a normal speed reel but also has a lot more power to rip a Bass out of whatever cover they’re sitting in. When choosing line, it’s always the heavier the cover, the heavier the braid. Fishing docks and sparse weeds you can get away with using 40 pound, but 50 is the standard for most situations. I like to use hi-vis yellow Power Pro since it makes watching the line much easier, but it’s important to colour the last 4 feet or so with a black Sharpie to hide it from the fish. I’m not sure if it makes a difference, but I always colour the line a few days before using it, to allow the ink to dry and let the marker smell fade away. There’s always new baits coming out, and they’re definitely worth giving a try. Having a plan like this just makes it easier to organize your tackle for any situation you may find. Tight lines! Good stuff. I too am a fan of the Curado 201G7 regardless of what people say about it. It’s just a smooth, solid reel at a great price. Thanks for the support! Love Shimano products, best on the market in my opinion. You’re both right about the Curado G7. It’s a solid reel. It has the speed you need to really turn fish towards you. Shimano intended the Curado G to be a step down from the its predecessor, the Curado E. I guess the idea was to return the Curado to its position in Shimano’s lineup as the more “affordable” reel. If you look at the Curado G you can see that its based off the Caenan as it shares the same frame, with some upgraded internals. I guess it depends on what you are willing to spend and if you can get your hands on the E series anymore (anglers are hoarding them like gold nowadays) Either way, the Curado G is a great reel.